For those of you who don't remember former SBA member Dennis Keim's link to their site on our e-mail list some time back, they can be found at www.andromedaspaceways.com. 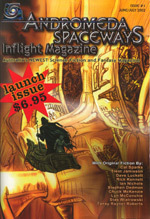 Published out of Australia, Andromeda Spaceways is a bimonthly magazine chuck full of science fiction. While they did allow themselves a bit of silliness in the first few pages of the first issue, the magazine quickly got down to business. Ten short stories only occasionally interrupted for small ads or artwork. I like the setup even though it is noticeably fannish-based. Very practical color cover with black and white paper instead of magazine slick inside. The only drawback is that they put in so much paper the staples in mine barely held through one reading. While few of the concepts are totally new, they do have good twists to them. Likewise the characters have known types but some of them you wouldn't expect to see in science fiction Nothing earth-shattering about the quality of writing but probably better fiction than most in-flight magazines. I liked a better percentage of the stories than I usually find in our standard short fiction magazines. I'll give it three and a half stars. While it would be an interesting match-up, Paramount has opted for the pen being mightier than the sword. 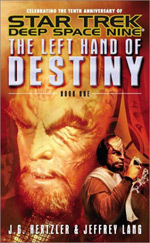 Andrew J. Robinson (Deep Space Nine's Cardassian tailor Garak) and J. G. Hertzler (Deep Space Nine's General Martok) have joined the ranks of actor/writers for Star Trek. Just short of 400 pages, it brings back the good old days when six and a half dollars bought a real book. 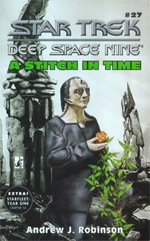 Robinson used a difficult style of writing as he tells the story of Garak's youth intermixed with thoughts during reconstruction after the occupation. Occasionally it was hard to follow, but Garak never really was a straight forward character. For those people who like the character, Robinson did a decent job of advancing the personality. For those wanting an adventure story I'd suggest looking elsewhere. Three and a half stars for the effort. Note the co-author. Lang doesn't have many projects under his belt, according to his author info, but the two made a decent writing pair. Just under seven dollars for just under three hundred pages of a trilogy is a bit steep even for a good story but it was a birthday gift so I won't complain too much. Praise be to whoever thought up Martok's wife. That's the kind of writing that makes us buy hundreds of books. The Lady of a Klingon house would of course berate a group of nine foot tall monsters for tracking mud on her carpets. Who cares if they could snap her in half, and indeed had just done so to her House's security force. I enjoyed how things fit in with known history. Even just the comment that the Klingons had wanted some time to themselves following that moon disaster a while back, so we won't worry right away about nobody calling us just because the capital city blew up, gave the story some depth. Toss in a Romulan, a coup, a hooded stranger, and a Ferengi garbage reclamation project, and you get a rather strange group of characters just trying to find their place in life. I give it four stars. Captain Sulu is back, and he's on a real mission. There is crew interaction, annoying diplomats, and non-humanoid aliens. What more could you ask for. True the aliens are just the Tholians who we saw in the television series but now they have a cultural background and secrets to hide. It's really the Neyel who are new. It seems they found themselves in a rather harsh neighborhood of space and a good defense turned into a good offense until they found themselves on the brink of racial war with the Tholians. But it's all just a minor misunderstanding and having both sides sit down to talk it over would of course bring peace and harmony to the whole universe, right? Well that might work if either side had a universal translator worth anything. Instead they both think the other side is a bunch of territorial barbarians who just happened upon space travel. So Sulu volunteers for a sword fight. Tell me you didn't see that one coming. The book has its odd parts but no more than the original shows did. 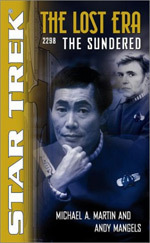 The different cultures were handled well and the relationship between Sulu and Chekov has some depth. Even Chapel got good screen time. I give it three and a half stars.